Shire of Bacchus Marsh. No. 265.Greystones Homestead and Outbuildings, "Greystones", Bacchus Marsh. Greystones was built for pastoralist Molesworth Greene in 1875-6 as the centre of his pastoral estate. Greene was born in Ireland, educated in Paris, and migrated to Port Phillip with his family in 1842. In 1848 he became a partner with his uncle C J Griffith in Glenmore Station near Bacchus Marsh. In about 1879 they divided the estate, and Greystones became a separate station. In 1875 Greene commissioned the architects Lloyd Tayler and Frederick Wyatt to design an imposing house to replace an earlier slab building. It was built by the Melbourne builder G Kirby. In 1854 Greene had married Emma, the sister of Rolf Boldrewood (TA Browne), and the family lived here in considerable style. Greene had pastoral properties in Victoria, New South Wales and Queensland, was a prominent member of the colonial society, won renown for his husbandry, and held many prominent positions, including Shire President, Trustee of the Melbourne Public Library and Museum and the National Gallery, President of the Melbourne Club, and Chairman of Directors of Broken Hill Mining Company. The property was inherited by Greene's son, W P Greene, and was purchased in 1934 by pastoralist and meat industry leader Sir William Angliss. Angliss was an English-born butcher, who became the dominant figure in Australia's highly competitive meat export trade, as well as a prominent pastoralist and a member of the Legislative Council of Victoria. In his later years he financed the William Angliss College in Melbourne (H 1507), now a well-known food-trades school. In 2003 Greystones was owned by Angliss's grand-daughter. There have been minor alterations and additions to the house, including a separate art gallery designed by the architect Peter Clarke. Greystones is a two storey homestead in a picturesque Gothic style, of local rockfaced bluestone with sandstone dressings and with a slate roof. The plan is asymmetrical, with four intersecting wings, and the entrance is through a forward projecting gabled wing under a pointed arch to a recessed porch. Two of the wings have canted bays, one of two storeys. Windows have pointed segmental heads. There is a single storey timber verandah on the eastern part of the house, and a service wing and kitchen garden on the west side. The homestead is the centre of an extensive complex, which includes the two storey stables and coach house of painted brick, a meat house (still in use), a dairy, workers' and managers' houses and workshops, and a timber shearing shed. The house is approached through wrought iron gates and along a winding driveway. The one and a half hectare garden provides an appropriate setting for the house, and is believed to have been laid out when the house was built. It has a summer house, one of the largest and most interesting nineteenth century rockeries in Victoria, a series of garden terraces, and is surrounded by a particularly fine drystone wall. It retains a strong nineteenth century planting character, with many rare plants. 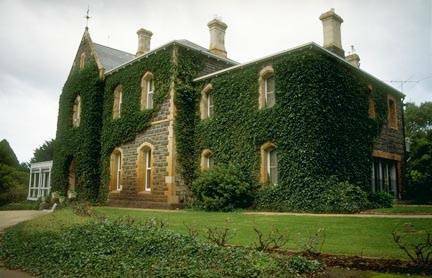 Greystones is of architectural and historical significance to the State of Victoria. Greystones is of architectural significance as a particularly fine and intact large Gothic homestead, with the many outbuildings typical of the period, set in an impressive and intact nineteenth century garden. It is an important domestic work by the Melbourne architects Lloyd Tayler and Frederick Wyatt, and demonstrates fine workmanship in local stone The drystone wall is a particularly fine example of the waller's craft. Greystones is of historical significance as a reflection of the wealth, taste and lifestyle of the wealthy pastoralists of Victoria in the nineteenth century. The many outbuildings are still in use and express continuity in the pastoral way of life since at least the 1930s. It is significant for its association with the pastoralist Molesworth Greene, an exceptionally successful pastoralist and an innovator in farming methods, and also with the outstanding meat industry leader, Sir William Angliss.